It would be fair to say that 2017’s most compelling reality show was the advent of Donald Trump’s presidency. It was a show replete with the oversized pronouncements, unpredictable tweets and disruptive “America First” rhetoric that characterized Trump’s unlikely campaign for the White House. Unlike in Europe, where political leaders aren’t reticent about expressing alarm when American leaders depart from their scripts, leaders in Asia remained watchful and largely discreet in their efforts to fathom the direction of US foreign policy. But there was much to be nervous about, from Trump’s initial mis-step on Taiwan to his hectoring of allies Japan and South Korea on trade issues. And, of course, there was his introduction of “Little Rocket Man” into the lexicon on North Korea. Trump’s first trip to Asia as president in November seems, for now, to have calmed nerves and clarified at least some issues regarding US priorities in the region — and cast light on his emerging “Indo-Pacific” strategy. 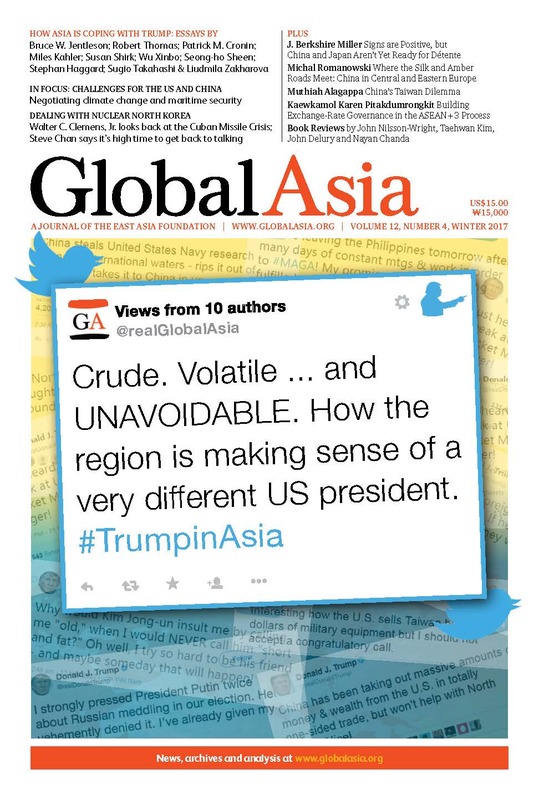 In our cover package, we feature a series of articles under the guest editorship of Stephan Haggard and Myung Hwan Yu on “Trump in Asia,” which had their origin in papers presented at a symposium Oct. 19-20 at the School of Global Policy and Strategy at the University of California, San Diego. The symposium received generous support from the Asia Research Fund, the Pacific Century Institute and the university’s Lawrence and Sallye Krause Chair. The articles not only dissect Trump’s approach to the region, but gauge how China, Russia, South Korea and Japan have adapted. “With all the uncertainties Trump has introduced, we might expect a region on edge. But a surprising finding of the Asian contributors’ papers is how all four major Northeast Asian countries have adjusted to the Trump era,” Haggard and Yu note in their introduction. In our Features section, we examine how the 1962 Cuban missile crisis that confronted the young US President John Kennedy provides lessons for the current North Korean nuclear and missile crisis; why engaging with North Korea, despite all of the obstacles, remains the only viable option for peace on the Korean Peninsula; China’s growing engagement with Central Asia and Eastern Europe and the ambivalent reactions it is triggering; why the prospects for better relations between Tokyo and Beijing face thorny limits, despite efforts on both sides to bridge their differences; how Taiwan is posing an increasingly complex dilemma for Chinese policymakers determined to see the island reunited with the Mainland; and why Asia needs to significantly enhance its governance framework for exchange rates to ensure stability and prosperity. Our In Focus section looks at two key issues confronting China-US relations in the region — energy policy and climate change, and the ongoing maritime disputes in the East and South China Seas. In the case of the former, the US decision to withdraw from the Paris climate accord represents a lost opportunity, because this was a notable example of China-US co-operation. On the latter issue, it is unlikely that the US under Trump will walk away from its long-standing position. And, as always, we feature reviews of some of the most engaging books on Asia. For decades, both North Korea and the United States have in their own way thwarted efforts to resolve the threat of a nuclearized North Korea. Both have cheated on, or failed to fulfill, past agreements to bring a halt to Pyongyang’s nuclear program. Asian allies are uncertain, China and Russia emboldened. Campaign, promises, fears, president, problems, gaps, challenges. A changing security environment due to the rise of China means care must be taken to nurture ties. Trump finally outlined his vision in Da Nang. Trump threatens to overturn, or at least radically alter, the longstanding role of the US as an open market for Asian exports. Relations with Beijing have raised eyebrows, and concerns. China scrambled to put the Sino-US relationship on a constructive path after Trump’s victory. That effort is paying off. Fresh from its own political turmoil, Seoul was slow to navigate a newly fraught relationship with Washington. How Shinzo Abe has skillfully adapted to the new reality in Washington and what might be expected. Why Moscow has chosen to look East. How a harrowing nuclear standoff between Moscow and Washington more than 50 years ago is still relevant today. Despite frustration in Washington with Pyongyang, the only viable option is to reject a military solution and restart talks. Tensions have begun to ease under Shinzo Abe and Xi Jinping. But are bilateral relations truly headed for greener pastures? Beijing's embrace of the region is running up against a host of concerns in the countries involved. As it is clear that its approach to relations with Taipei isn’t likely to lead to unification, Beijing has a problem. With Trump deciding to pull out of the Paris climate accord, China is poised to lead the world on climate issues. It does not have to be this way. Despite rhetorical bombast, US security policy in Asia so far under President Trump has been fairly consistent with past administrations. A selection of 13 new titles of interest on Asia.